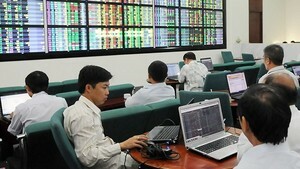 The Vietnam’s benchmark VN-Index rebounded to above 500 on May 20, as most blue-chip stocks rallied. The shares of 228 companies and four mutual funds listed on the Ho Chi Minh Stock Exchange jumped by 8.65 points, or 1.75 percent, to wrap up the trading session at 503.55. More than 59.9 million shares changed hands, totaling VND1.89 trillion. Only 46 stocks fell among index members, with 145 gaining, and 41 remaining flat. From the opening bell, Saigon Thuong Tin Commercial Joint Stock Bank or Sacombank (STB) bounced back strongly; taking the top spot for most active shares with more than 4.27 million shares were traded. Saigon Securities Inc. (SSI) came next with 3.58 million shares, followed by the Hanoi-based Vietnam Mechanization Electrification & Construction Joint Stock Company (MCG) with 1.34 million shares. Vietnam’s largest brokerage house announced its current chartered capital of more than VND3.51 trillion. Binh Minh Plastics Joint Stock Company (BMP) was the biggest gainer on the city bourse, seeing its share value increase to the daily maximum allowed limit of 5 percent to VND52,500. Viet Nam Sea Transport and Chartering Joint Stock Company (VST) rose by 4.98 percent to VND23,200. Ben Thanh Trading & Service Joint Stock Company (BTT) and Ho Chi Minh City Infrastructure Investment Joint Stock Company (CII) both climbed 4.92 percent to trade at VND40,500. Hoang Long Group (HLG) led the list of big losers on the southern market, dropping 4.91 percent to VND40,700. Dang Hoang Phuong, deputy general director of Hoang Long Group, registered to buy 70,000 shares between May 24 and July 24 to increase his holdings to 100,000 shares. Dong A Plastic Group Joint – Stock Company (DAG) and Meca Vneco Investment and Electricity Construction Joint Stock Company (VES) finished day at VND19,500. Both stocks closed the day down 4.88 percent. VES planned to hold their annual shareholders’ meeting in District 7, HCMC on June 21. Ninh Van Bay Real Estate Joint Stock Company (NVT) slid 4.87 percent to VND25,400. The Hanoi’s HNX-Index also posted a small rise, advancing 2.85 points, or 1.78 percent, to close at 163.36 as more than 60 percent of members gained. Around 54.5 million shares, worth VND1.67 trillion, changed hands. The UPCoM-Index of unlisted stocks slightly rose by 0.14 points to 50.25. A total of 87,275 shares were traded at VND1.3 billion.